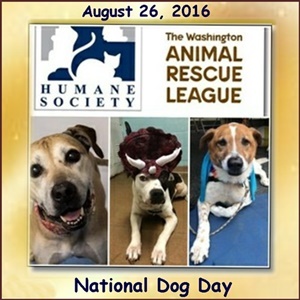 Washington, DC — Friday, August 26th is National Dog Day and the Washington Humane Society-Washington Animal Rescue League (WHS-WARL) is encouraging everyone to celebrate Man’s Best Friend. All animals available for adoption at WHS-WARL have been spayed/neutered, microchipped and are up to date on vaccinations. Donate toys, blankets, towels or pet food! Spend some quality time with your dog! National Dog Day is a great day to spoil your dog with extra attention and affection, a healthy treat, a new pet toy and some quality play time. 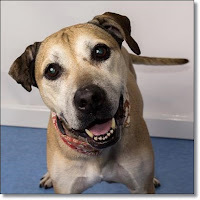 As an animal advocate/lover, there is a special spot in my heart for senior animals. 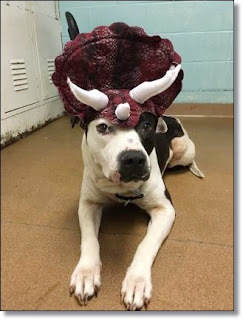 They are the ones that are over-looked at adoption events. Most people want a puppy, and have no idea what great love senior animals can bring into their lives. I want to spotlight three senior dogs, Marzipan, Bailey and BB, who are looking for loving homes to spend their senior years. 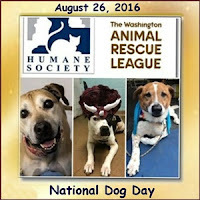 If you have room in your home and in your heart, please consider adopting either, Marzipan, Bailey or BB, or any of the other animals available at the Washington Humane Society-Washington Rescue League! Hey there! I'm Marzipan and I'm just as sweet as my name would suggest. I lived with the same family for over 9 years, but they couldn't take care of me anymore, so I ended up here at the shelter. That's OK though! I'm really enjoying all the walks and attention that I'm getting here while I wait for my forever home. I have previously lived in a home with small children and other dogs, so I may be a good dog for a family that's looking to add to their home. At 10 years old, I'm well past all the puppy nonsense, and while I still have a lot of life left to give, I'm definitely more of a mellow companion than a running buddy. I do really like going on walks and getting out of the house, but I don't need the kind of exercise that a younger dog would require. I can't hear very well, but don't worry - I have quite a talented nose, and if I smell some cheese in your hand I will pay very close attention to you, I swear. If you think I could be a good fit for your family, please come see me! I'd love to go to my new home soon! To learn more about Marzipan, click HERE! To learn more about BB, click HERE! Bailey is a 9 year old Shepherd mix, he was a wonderful family dog for 9 years, before circumstances changed and they were no longer able to keep him. 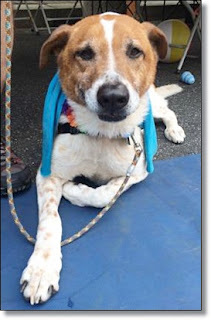 He loves other dogs, and would be most successful in a home where he can have another canine companion. He does have a prey drive, so he needs a home without small animals (cats). He's been good with kids and doing well with his training manners. He just loves to be outside and lay in the sun. If you would like to meet Bailey, come visit him at Oglethorpe shelter today! To learn more about Bailey, click HERE! Please share with family, friends and co-workers!